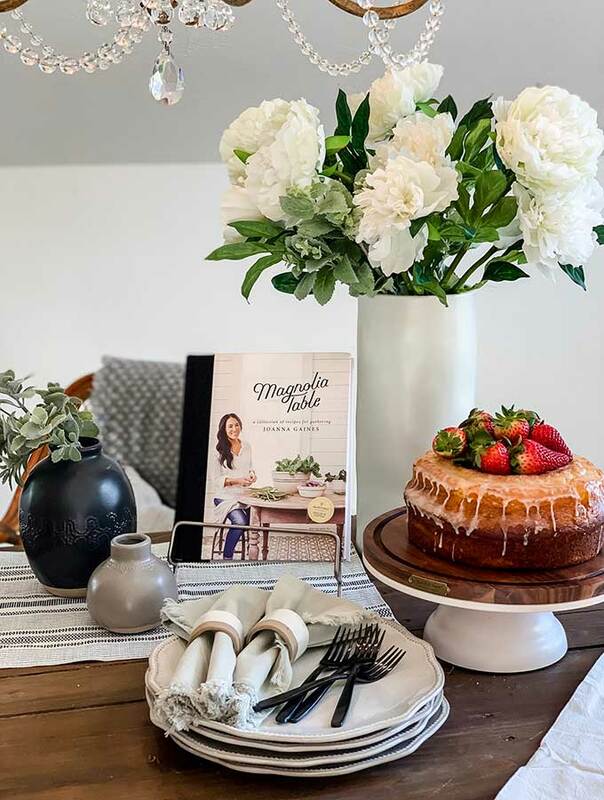 Do you have the Magnolia Table cookbook? I love how she encourages us to take her recipes and change them to fit our families style. I think it is so much fun to look at a recipe and switch it up and add your own idea. We made her lemon bundt cake, but with a strawberry shortcake twist. 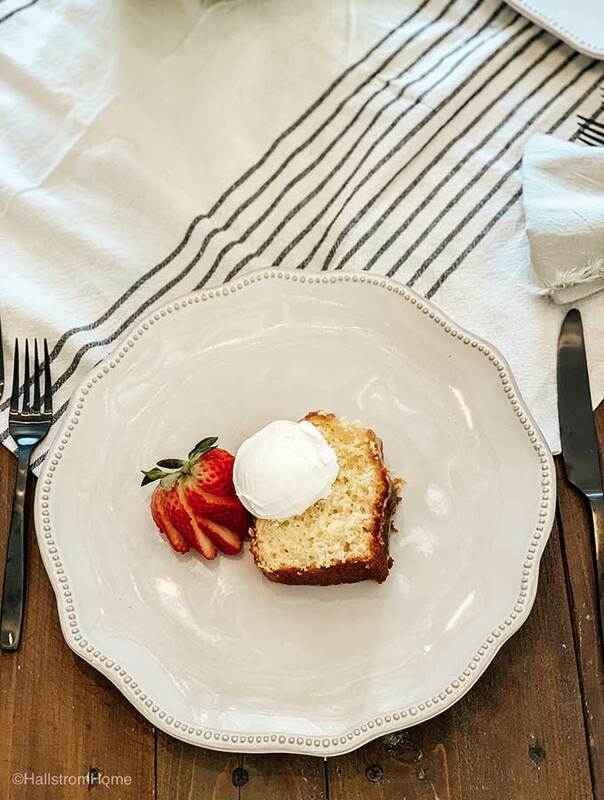 Here we are sharing the Lemon Bundt Cake by Magnolia Table. 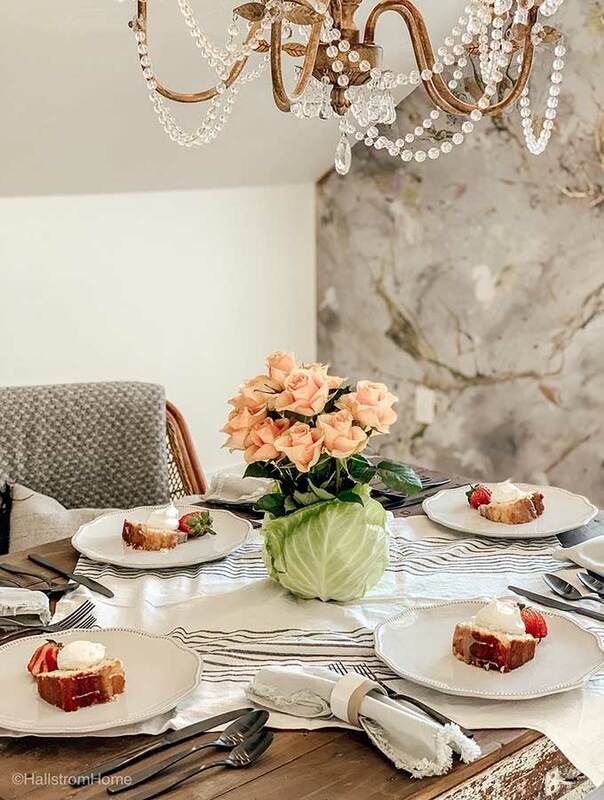 Easter is just around the corner so a group of ladies and I wanted to share with you some of our favorite Easter desserts. 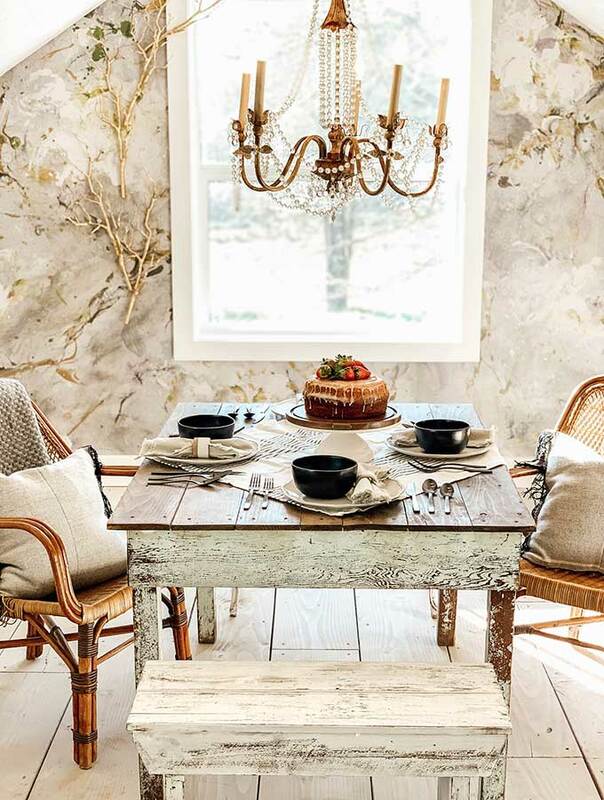 Often at our old crusty farmhouse we use a lot of the Magnolia Home collection to add that modern farmhouse style. Her style is so simple, but very fashionable. 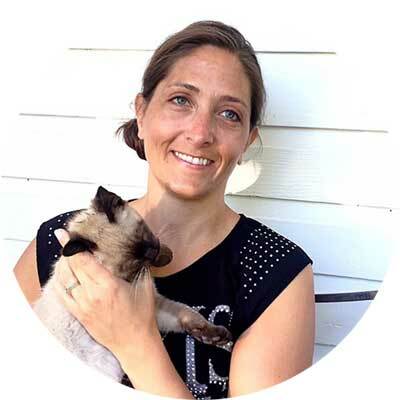 We have a shopping guide for Hearth and Hand if you want to check it all out. Oh I can’t forget about her awesome new cookbook. 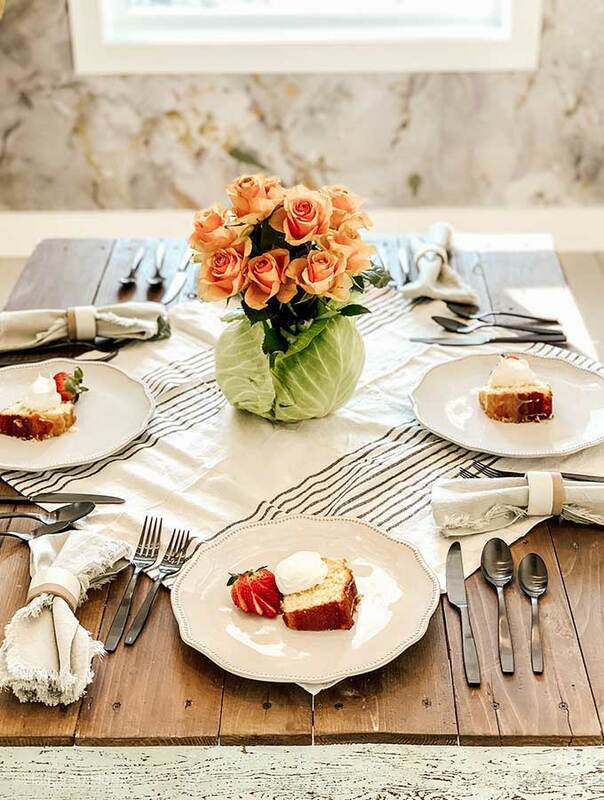 Magnolia Table is now my new favorite, it has so many great recipes for the busy mom. Not too long ago we made Magnolia Table Pizza, now that was delicious. The best part was it was so easy! This time we are going to create her bundt cake. Something I really love about this cookbook is that Joanna encourages you to change it up and fit your family. So that is exactly what I have done in creating the recipes out of Magnolia Table. Do you have her other new book Home Body? I don’t but it looks pretty cool, I’m thinking I need it! Let’s get back to the food. There is nothing quite like a great dessert. 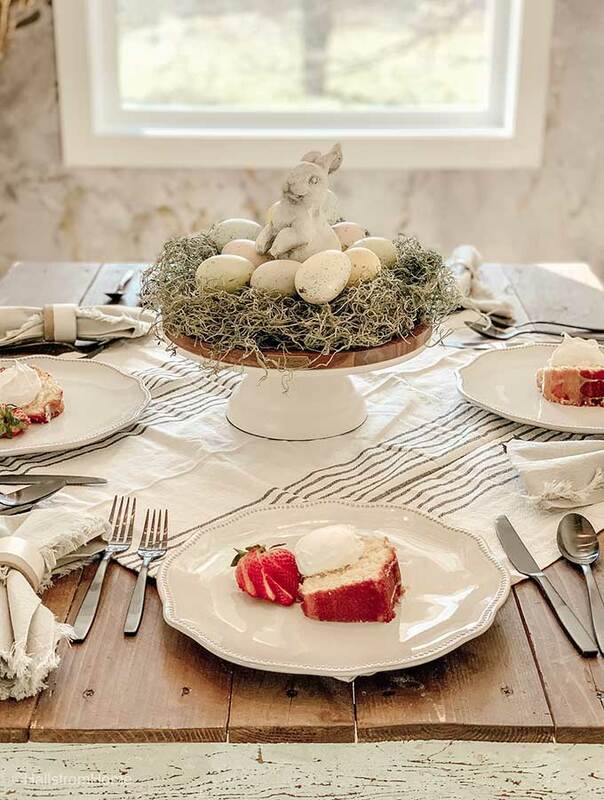 So I will share with you some Easter desserts I think you would really enjoy. Keep on reading to see all the tasty desserts. 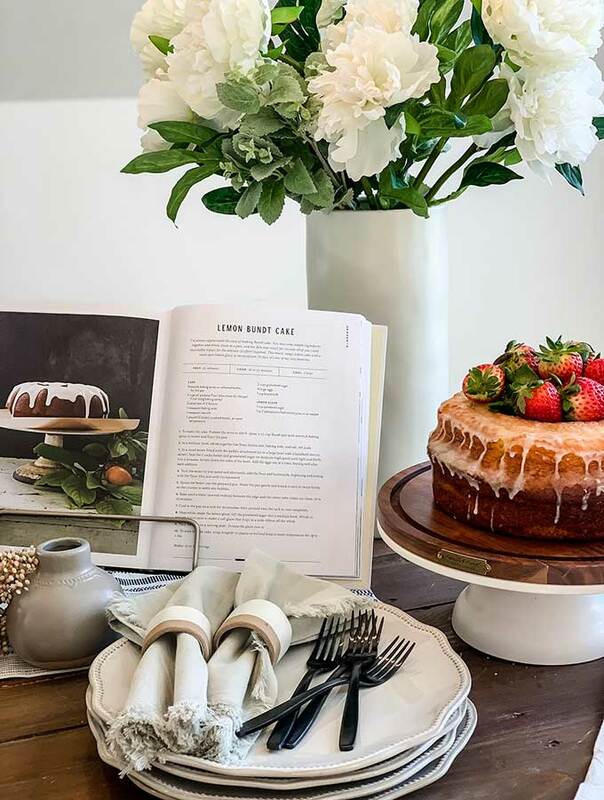 Who loves a great bundt cake? I sure do. But to add my own idea to this recipe was to make it as a strawberry shortcake. To begin I followed her exact recipe, which I will share with you at the bottom of this post. I’m telling you, this is one of the best lemony cakes I have ever tasted. It was one of those days where we needed a fresh dessert to get us into Spring. It is finally here and I couldn’t be more excited. A lemon bundt cake it was! But I wanted to add another element, and strawberries came to mind. My kids love to eat on strawberries when they come in season, so strawberries were perfect. For the glaze I once again followed her recipe. I made mine just a bit thinner. The glaze is so simple, but really delicious. It could work for most desserts that you would want a glaze on. This cake has the perfect flavor balance of pound cake layered with the great lemon flavor of a tart powdered sugar glaze. What a perfect combo. Now this is how I made it a Strawberry Shortcake for Easter. After following her exact recipe, I cut up a piece for each person. Then I sliced up a strawberry and placed it next to each piece. For the final touch, I added a dollop of cool whip. Of course homemade whip cream is best, but I didn’t have anything on hand to make it. But cool whip does the trick, it is a great replacement for whip cream. That’s it! 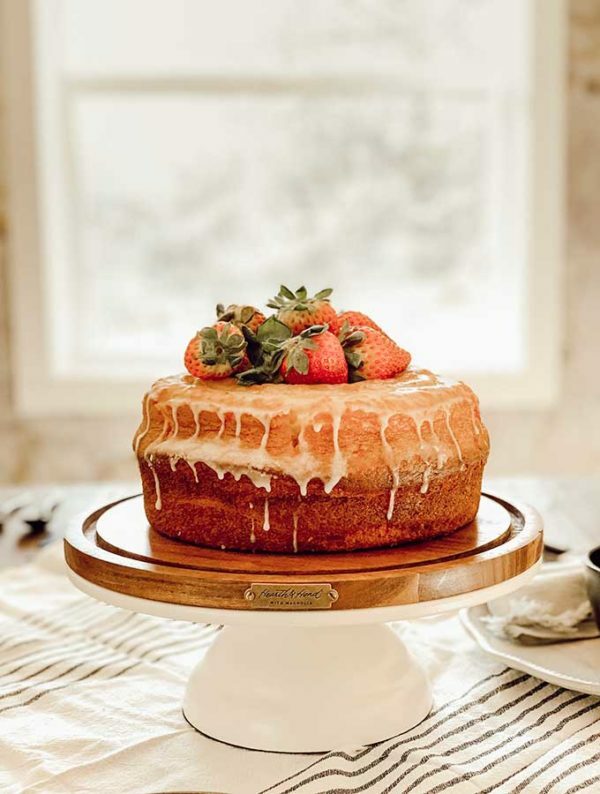 I think this is a great way to create a spin on the traditional strawberry shortcake. So you get a two in one dessert! I like to keep my busy life as simple as possible, but still make it great. This is one way to do it. It is still the exact recipe, but with a couple special editions to the plate. Strawberry shortcake is a perfect Spring treat for an Easter dessert. Time to share with you the other amazing Easter dessert recipes to make for a very important day. What desserts do you like to create on Easter day? 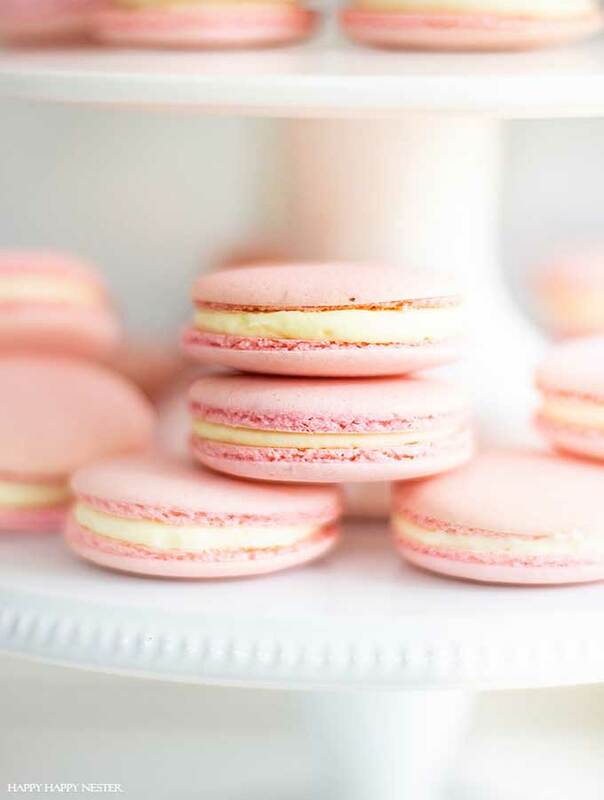 Janine made these darling macarons for Easter. They look so perfect, and the color is great for Easter. Now just if I could get them to look that good! 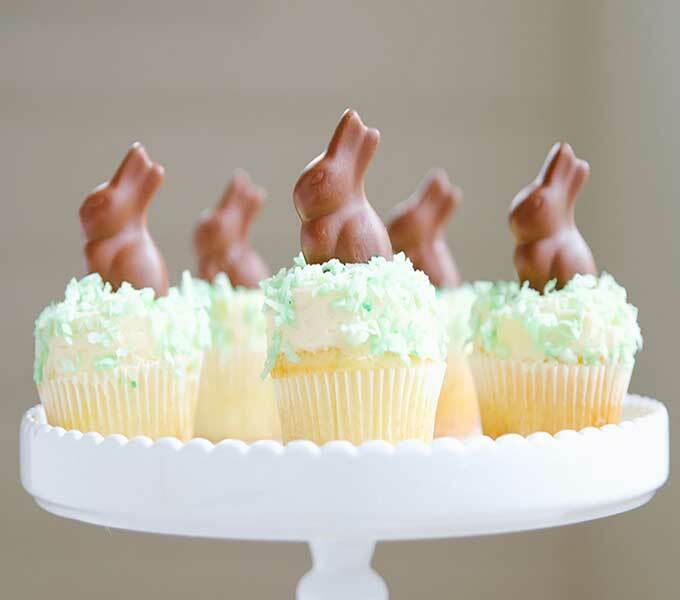 Chocolate bunny cupcakes are an easy but cute dessert for Easter. My kids would have so much fun making these sweet cupcakes. Nothing like a little chocolate bunny for Easter. 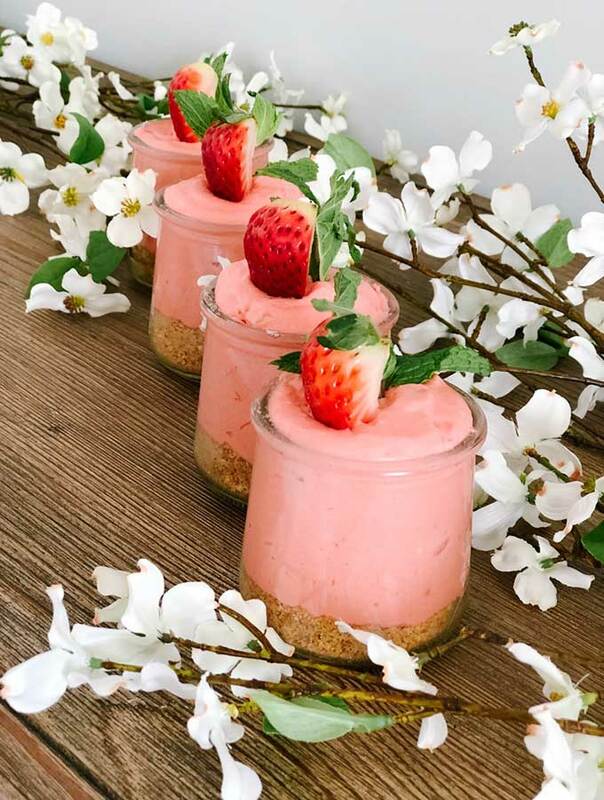 These light and fluffy strawberry cheesecake mousse parfaits the perfect touch for Spring. I could really use one of these right about now. Nothing is quite like a homemade apple pie. Leslie made this beautiful pie, perfect for and Easter dessert. 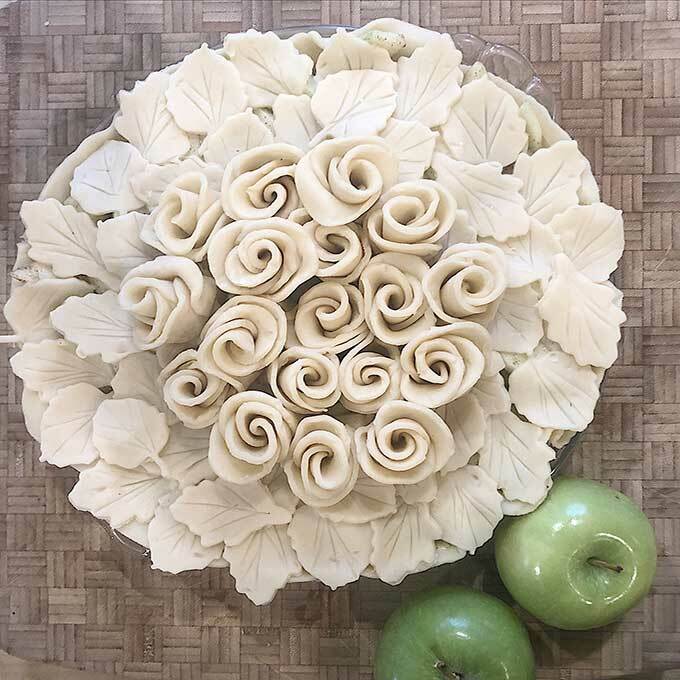 I’ll just be wishing I could make a pie as pretty as this one. Preheat oven to 350F. Spray 12 cup bundt pan with non stick spray. In medium bowl, whisk flour, lemon zest, baking soda, and salt. Set this aside. In a mixer with the paddle attachment, beat butter and sugar on medium high speed until light and fluffy. Scrape down sides and add eggs one at a time, beating well after each. Turn mixer to low and alternately add the flour and buttermilk. Begin and end with flour. Mix just until incorporated. Spoon batter into prepared pan. Knock on counter a couple times to settle any bubbles. Cool in the pan for about 30 minutes, then unmold onto a cooling rack. Sift the powdered sugar in medium bowl. Whisk lemon juice to make a soft glaze that drips in a wide ribbon off the whisk. Place cake on a serving plate. Drizzle glaze over top. Sorry Lisa, I updated it again and it’s down at the bottom of the post. Thanks!! This looks so yummy! I’m going to have to give it a try! Thanks Claire! Yes it’s delicious. Your lemon cake looks so good!! I can’t wait to make some!